POST a QUESTION or READ FAQs about brick wall weep inserts & where to buy masonry wall weep opening inserts & products for shell drains. 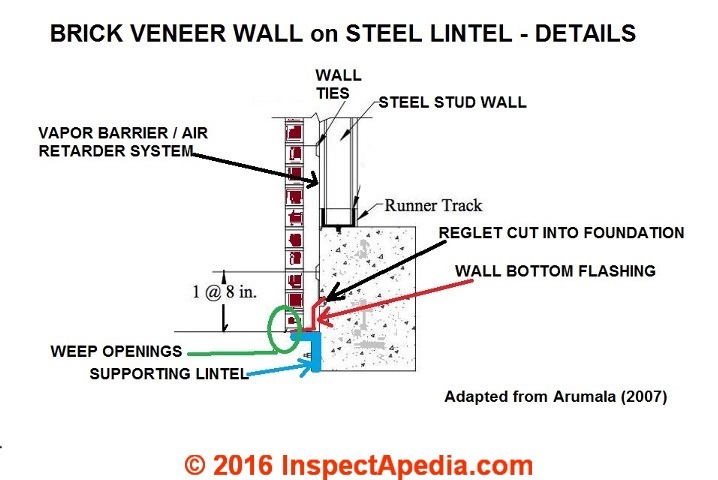 Here we give construction specifications & details for proper location, flashing, & protection of weep holes or drain openings & vents in brick or other masonry veneer walls. We explain how these weep or vent openings in brick walls work, where and how they should be installed, and what special products such as opening screens & flashings are available.
. Weep holes in building exterior masonry walls (brick or stone) are a drainage system that is used in cavity wall or rain-screen wall construction methods to get rid of water that has penetrated the outer wall skin or surface. Brick veneer construction [and some other masonry veneer construction such as thin stone over wood framed walls] incorporates a drainage cavity to deter water penetration into the building. This air space creates a physical separation between the brick wythe and the inner steel stud wall. Watch out: Both structural brick walls and veneer brick (or stone) walls may be designed either as a barrier wall or a cavity/rain-screen wall. Before you can evaluate the condition of a wall you need to understand how it was built and whether or not the as-built matches the as-designed conception of the wall. Our page top sketch, courtesy of Carson Dunlop Associates, a Toronto home inspection & education firm, shows both the reasons for and the typical design details used in weep openings on brick walls. [Click to enlarge any image]. The beautiful Flemish-bond structural brick wall (left) on the Vassar College Campus was constructed with very subtle drain or weep openings at the wall bottom. It has survived intact even though the building is located in a seasonally wet and freezing climate. Watch out: In February 2016 in the U.K. The Telegraph reported that the Cavity Wall Insulation Victims Alliance (CWIVA) was lobbying both industry and government to obtain relief from insulation companies who were selling this bad approach to building energy savings by representing that their insulation was "government-backed" - it was not and it is not. Some of these news reports "mould in wall cavities is caused by insulation" describe a real problem but do not necessarily offer a correct explanation of the cause of the mould contamination. Insulation does not itself cause mould growth. Mould spores are present everywhere, all the time, in air. But when conditions are right, particularly trapped moisture and perhaps temperature, mould growth will be encouraged in and on buildings. Since the mid 1980's building scientists have known stressed that air leaks into and out of wall cavities at penetrations (openings for receptacles, switches, wires, pipes) is a particular source of moisture problems. If we combine leaks or moisture with improper placement of insulation, such as pumping or blowing styrofoam bead or other insulation into the air space between a brick veneer wall and the building's structural (usually wood-framed) wall, then yes, that's a recipe for trouble. Brick veneer walls are not waterproof and must be designed to permit water to drain out of the wall rather than into the wall interior. This article provides details about the importance of providing proper drainage for brick veneer walls. Weep openings are drainage holes left in the face of a brick veneer wall [and possibly some other constructions] in order to allow water that has penetrated the wall to escape downwards through the wall cavity and out to the exterior of the wall surface through the weep openings. As will be explained later, I think the weep openings in the veneer wall shown above, though properly located, are probably not working. Openings placed in mortar joints of facing materials at the level of flashing, to permit the escape of moisture, or openings in retaining walls to permit water to escape. Above we illustrate the most basic brick wall weep opening. To diagnose a building water entry or moisture problem originating at its exterior walls we must first understand the construction concepts that were used to build that wall: two very different concepts apply, though they often appear mixed or even confused in buildings: barrier wall construction methods (the wall exterior skin keeps out water) and cavity or rain-screen wall construction (the wall is designed to handle and get rid of water that penetrates the outer skin). See WALL CONSTRUCTION BARRIER vs CAVITY for definitions and explanations of barrier wall construction compared with cavity / rain screen exterior wall construction methods, objectives, and damage vulnerabilities. Below we show a brick wall (a veneer in this case) with weep openings at regular intervals at two heights above ground level. Below is a close up of one of the drainage openings. Veneer wall weep or drain openings are placed at least at the very bottom of a brick veneer wall cavity and sometimes as vents openings are placed higher in the wall in some designs. For the wall shown in the photos just above, we suspect that an air space behind the veneer does not extend lower than the weep holes in our photos. Why? The lower wall is solid masonry construction with no air space rather than frame construction. The lower brick courses were laid tight, with no cavity at all, against a solid concrete or masonry block foundation wall, thus forming a solid composite masonry wall. 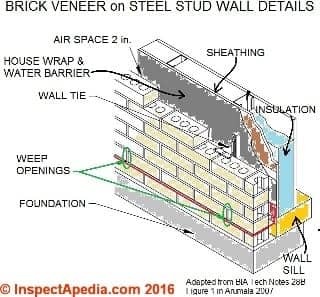 Here are three examples of wall cavity vent and weep opening specifications adapted from the Brick Industry Association (BIA), our industry expert source, and from two example construction specifications for brick veneer walls that offer more details. Note: the specifications for any particular building project should be made by a qualified design professional such as a licensed professional engineer or licensed architect. Most building codes permit weeps no less than 3 /16 in. (4.8 mm) diameter and spaced no more than 33 in. (838 mm) o.c. Wick and tube weep spacing recommended at no more than 16 in. (406 mm) o.c. - BIA 28B cited below. Above, these weep openings are properly located: above the upper surface of the wall bottom flashing, and they might meet the BIA's 3/16" (4.8mm) diameter, but in my opinion they are inadequate. 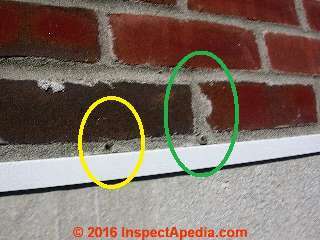 At BRICK VENEER WEEPS BLOCKED or MISSING we show that these tiny tubes inserted as veneer wall drains were mostly blocked by mud placed by mud-dauber wasps. Little wall-bottom tubes are also very easily blocked by falling mortar and debris in the wall cavity. Good location, weak weeps. At BRICK WALL DRAINAGE, FLASHING, VENTILATION PRODUCTS we illustrate a taller, blockage-resistant PVC product that provides better veneer wall drainage opening protection, letting water out while preventing insect intrusion. Wall shall use pre-formed control joints using rubber material. Provide with corner and tee accessories and fused joints. Install cavity vents in veneer walls at 16" (400 mm) on center horizontally below shelf angles and lintels and at top of walls. Install cavity mortar diverter at base of cavity as recommended by manufacturer to prevent mortar droppings from blocking weep/cavity vents. Do not permit mortar to drop or accumulate into cavity air space or to plug weep/cavity vents. Above: Brick veneer wall construction details showing weep openings immediately above flashing that is in turn atop bottom brick course of a brick veneer wall constructed over a steel stud cavity wall. These details are for a brick veneer wall that rests atop a masonry foundation. This illustration is adapted from BIA Technical Notes 28B, Figure 1 as used in Arumala 2007 cited below. Critical wall bottom flashing is shown in red, brick veneer weep opening locations above the horizontal portion of that flashing are shown in green, and house-wrap / water barrier fabric(s) are shown in dark gray. Watch out: Less evident in our sketch but important: the water barrier affixed to the wall sheathing should extend over the top of the wall bottom flashing, not behind it. Otherwise water in the wall cavity may pass behind the bottom flashing and thus will fail to drain from the wall cavity. 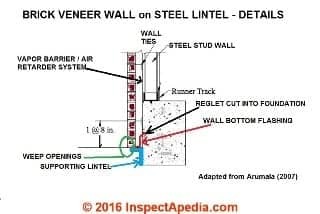 Below: Brick veneer wall construction details showing the location of weep openings immediately above wall bottom flashing that is in turn immediately above the upper surface of the supporting steel lintel in a lintel-supported brick veneer wall design. As our photograph above illustrates, in tall brick veneer walls additional weep openings and air vent openings may be specified by the architect/engineer for placement higher in the wall. Size: Height 2-1/2 inch maximum except as indicated otherwise, by full width of brick. Color: To match mortar color. www.mortarnet.com, CavClear Weep Vents by Archovations, Inc., PO Box 241, Hudson, WI 54016, (888) 436-2620, www.cavclear.com. www.mortarnet.com. or CavClear Masonry Mat by Archovations, Inc., PO Box 241, Hudson, WI 54016, (888) 436-2620, www.cavclear.com. Size: Height 10 inches, thickness as required to fill cavity. Form weep holes in mortar joints of exterior wythe of cavity walls at bottom of cavity over foundations, bond beams, through wall flashings, and other water stops in wall. Form weep holes by leaving head joint free and clean of mortar, and raking out bed joint at weep hole. Space weep holes approximately 24 inches oc. Keep weep holes free of mortar droppings and other obstructions. At completion of masonry Work, fill holes in joints (except weep holes) and tool. Arumala, J. O. and Brown, R. H., “Performance Evaluation of Brick Veneer with Steel Stud Backup”, Department of Civil Engineering, Clemson University, Clemson, South Carolina, April 1982. Through-wall flashing is an impermeable membrane placed in the wall that extends from the sheathing, across the air space, and all the way to the exterior of the brickwork (see Figure 1). One should place flashing at all points where the air space is closed off. Model building codes require flashing at the foundation, above window and door heads, at window sills, and where the roof of a one-story wing meets a two-story brick veneer wall. Flashing should extend from the outside face of the veneer, through the thickness of the brick veneer, across the air space to the backing, and then up at least 8 inches. The flashing should either extend up behind the water-resistant barrier or should be attached to its surface with a termination bar. Flashing held back from the outside of the brick veneer— even just 1/2 inch—could allow water to re-enter the wall. BIA, “Brick Masonry Cavity Walls: Introduction,” Technical Notes on Brick Construction No. 21, Rev., Brick Industry association, Reston, VA., 1998. BIA, “Brick Veneer/Stud Panel Walls,” Technical Notes on Brick Construction No. 28B, Rev. II, Brick Industry association, Reston, VA., 1999. Choi, Edmund CC, and Zhihong Wang. "Study on pressure-equalization of curtain wall systems." Journal of Wind Engineering and Industrial Aerodynamics 73, no. 3 (1998): 251-266. In recent years, aluminium-curtain-wall systems are often used in southeast Asia. Many of these curtain-wall systems can be classified as a two-barrier system with a front-panel (the rainscreen) and the back-panel (the air barrier). The back-panels of such systems are usually thin and flexible. Compared with the brick or brick-veneer rainscreen walls, where the back-panels are very rigid, the pressure-equalization characteristics are expected to be quite different. To improve on the understanding of the behaviour of such systems and to evaluate design parameters, full-scale measurements were carried out. A numerical model which takes into account the flexibility of the back-panel has been developed for the prediction of cavity pressure in curtain walls. The results based on this model show good agreement with those obtained from full-scale experiments. Drysdale, R.G. and Kluge, A., “A Summary of Performance of Brick Veneer/Steel Stud Wall Systems Subject to Temperature, Air Pressure and Vapor Pressure Differential,” Seminar on Brick Veneer Wall Systems, Toronto, Ontario, Canada, June 1989. ICBO 1997, Uniform Building Code, International Conference of Building Officials, Whittier, CA, 1997. Keeton, B., “Prevent Water Intrusion and Minimize Exposure to Claims by Building with Mold in Mind” Construction Executive, vol. 13, No. 7, pg 46-48, Association of Builders and Contractors, 4250 North Fairfax Drive, 9th Floor, Arlington, Virginia 22203, June 2004. Masonry Standards Joint Committee (MSJC), “Building Code Requirements for Masonry Structures”, (ACI 530- 05/ASCE 5-05/TMS 402-05), American Concrete Institute; Structural Engineering Institute of the American Society of Civil Engineers; The Masonry Society, Boulder CO, 2005. McGinley, Mark W., “An Alternative Design for Brick Veneer Steel Stud Walls”, The Masonry Society Journal, The Masonry Society, Vol. 18, Number 2 pp. 9-22, December 2000. Reneckis, Dziugas, James M. LaFave, and Wade M. Clarke. "Out-of-plane performance of brick veneer walls on wood frame construction." Engineering structures 26, no. 8 (2004): 1027-1042. Full-scale brick veneer wall panel specimens, representing typical residential construction practice, were investigated under static and dynamic out-of-plane lateral loading on a shake table. The tests captured the overall performance of the wall system, including interaction and load-sharing between the brick masonry veneer, corrugated sheet metal ties, and wood frame backup. The tests evaluated the effects of two different tie installation methods, as well as a veneer-to-backup connection repair using post-installed mechanical anchors. The progression of system damage was noted up until partial collapse of the veneer walls; tie stiffness and strength were found to significantly affect wall performance at all stages of behavior. Analytical models for veneer wall systems are being developed based on these experiments to further study the vulnerability of this type of construction. Straube, J. F., and E. F. P. Burnett. "Rain control and screened wall systems." In Proc. 7th Conf. on Building Science and Technology. Durability of Buildings. Design, Maintenance, Codes and Practices. Toronto, pp. 20-21. 1997. Treshsel, H. R., editor, “Moisture Control in Buildings”, ASTM manual series MNL 18, 1994 American Society for Testing and Materials (ASTM), pp. 224-225, 1994. Van Straaten, Randy. "Measurement of ventilation and drying of vinyl siding and brick clad wall assemblies." (2004). Control of moisture and heat flow through building enclosure assemblies is a critical component of overall building performance. This thesis shows that significant drying of moisture in wall assemblies is possible and that ventilation of cladding significantly increases the rate of drying in some assemblies without having detrimental impact on the enclosures thermal performance. A review found that thermal and moisture buoyancy, wind pressure gradients and mechanical equipment drive ventilation airflow. This ventilation flow can theoretically increase the effective water vapour permeance and thermal conductivity. Ventilation has the potential to increase outward drying through relatively impermeable claddings at the low flows expected to occur in service. The impact on thermal conductance is much less. A methodology for assessing the complicated airflow resistance characteristics of lap sidings was developed and applied to a representative vinyl siding. Field drying studies showed that the sample tested is well ventilated. Field brick veneer clad wall samples were also tested for system airflow resistance over a range of driving pressures. Theoretical predictions under-estimated the measured flow rate for given steady driving air pressures. Measurements of naturally driven cavity air speeds and smoke pencil testing showed that flow rates were commonly occurring that would in theory significantly affect the hygrothermal performance of the walls. This was confirmed with field drying studies. A field drying study of east-facing test wall with vinyl siding and brick veneer cladding was conducted in Waterloo, Ontario, Canada. Significant amounts of drying and inward moisture redistribution were measured. Wall sheathing dried quickly in hot summer conditions but in some cases significant inward driven moisture flow occurred. In cool and cold weather the wall dried more slowly and much less moisture moved inward. Increased cladding ventilation significantly increased drying rates and reduced internal wall assembly moisture levels. It was concluded that cladding ventilation acts to increase the effective vapour permeance of cladding and to reduce solar driven inward vapour drives. The use of spun bonded polyolefin sheathing membrane in lieu of #15 asphalt impregnated felt was found to improved hygrothermal performance in the test walls. The difference observed was concluded to be due to the higher vapour permeance of the spun bonded polyolefin and may not hold for wall assemblies with lower permeance sheathings (e. g. oriented strand board and foam plastic). Walls clad with vinyl siding dried faster than those clad with brick veneer. It was concluded that the vinyl siding is a well ventilated cladding system. Williams, Mark F., and Barbara Lamp Williams. "Water Intrusion in Barrier and Cavity/Rain Screen Walls." In Water in Exterior Building Walls: Problems and Solutions. ASTM International, 1991. 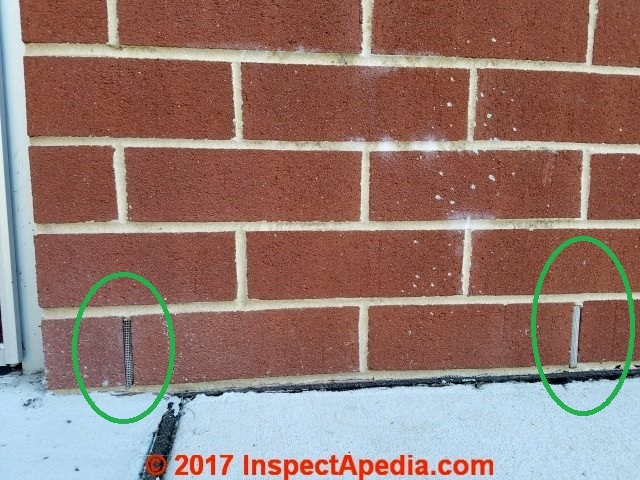 Where do the Brick Wall Drainage Openings (Weep holes) Belong? Details of this topic are now at BRICK VENEER WEEPS BLOCKED or MISSING. Brick Veneer Wall Through-Ventilation - Airflow Removes Moisture? Shown above: A Tamlyn Building Products brick vent screen discussed in the article linked-to just above. Continue reading at BRICK VENEER WALL WEEP HOLE LOCATION or select a topic from closely-related articles below, or see our complete INDEX to RELATED ARTICLES below. 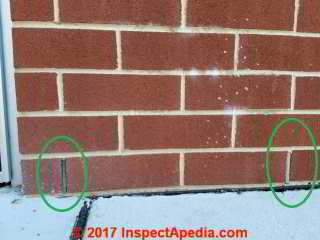 BRICK WALL DRAINAGE WEEP HOLES at InspectApedia.com - online encyclopedia of building & environmental inspection, testing, diagnosis, repair, & problem prevention advice. FOUNDATION CRACK EVALUATION discusses detail the process of evaluating foundation cracks and signs of foundation damage by examining the crack size, shape, pattern, and location. FOUNDATION DAMAGE SEVERITY discusses how we decide the severity of foundation damage and the urgency of further action. FOUNDATION FAILURES by TYPE & MATERIAL describes the types of foundation damage, cracks, leaks, or other defects associated with each type of foundation material (concrete, brick, stone, concrete block, etc. ).